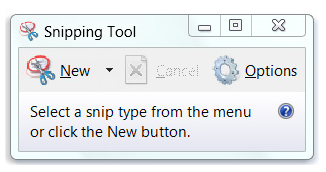 If you’ve ever found a great image you’d like to add to a presentation, or a piece of text you’d rather not have to retype, only to find that you cannot copy it to your clipboard, then you will certainly like Microsoft’s “Snipping tool”. This is a simple little gadget which basically gives you a better alternative to using the “print screen” button. Unfortunately Snipping Tool is not available in school due to Microsoft’s licensing set-up, but if you’re using a Windows PC or laptop at home, you’ve almost certainly got access to it there. To find it, just click “Start” and then type “snipping” into the search bar. You can see a short video explaining how the tool works here. Thanks to Peter for sharing this. This entry was posted in Visual resources, Web Tools and tagged copy, edit, snipping, tool. Bookmark the permalink.